Saint-André is a brand of French triple crème cow's milk cheese with a powdery white, bloomy skin of mold, in the form of a 200g cylinder, 6cm in diameter and 5cm high. Originally developed and manufactured by the Soulié cheese factory in Villefranche-de-Rouergue, Aveyron, it is now produced in Vire, Calvados. It has a soft buttery texture, tangy edible rind, and tastes like an intense version of Brie. Cream is added to the cheese during manufacture, and the curing process lasts approximately 30 days. The cheese is highly perishable and should be consumed within a week of its purchase. 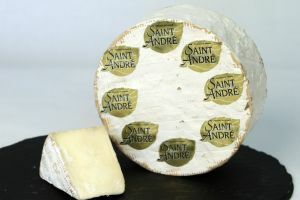 The fat content of Saint-andré is so exceptionally high it can make a white wine taste sour and metallic: a crust of baguette and a light beer or simply a slice of pear are suggested by the manufacturer as better complements.